Tennessee added a commitment late Saturday night after their Orange & White Game, and it came from a very versatile athlete who has flown under the radar. Jimmy Calloway is a three-star athlete who plays for Morrow High School in Morrow, Georgia. He announced on his Instagram on Saturday night that he had committed to Tennessee in the 2020 class. According to the 247Sports Composite rankings, Calloway is the No. 787 overall prospect and No. 60 athlete in the 2020 class. He holds offers from Oregon, Kentucky, Georgia Tech, and Kansas among others. The 5-foot-11, 170-pound athlete might be rated lower right now, but don’t expect that to stay the case if he keeps doing what he’s been doing as of late. You can get all of our in-depth and exclusive Tennessee recruiting content by becoming a member of RTI Premium today! In March, Calloway was named the top overall player at the Pylon 7v7 Tournament, and he even drew the attention of Carolina Panthers quarterback Cam Newton while there. This year alone, Calloway has added offers from (chronologically) Georgia Tech, Kansas, Oregon, Tennessee, Wake Forest, Kentucky, Syracuse, and MTSU. Tennessee and Calloway have been in contact with each other for a while, and it culminated in UT extending an offer to him in January. He’s visited campus at least twice this year counting Saturday’s visit, and it’s clear that Jeremy Pruitt, Tee Martin, the rest of UT’s staff like what Calloway brings to the field. When you look at his film, it’s evident why Calloway has blown up after his junior season. Calloway quite literally did it all for Morrow this past season. He played wide receiver primarily, but he also played quarterback, defensive back, returned kicks, and even punted the ball. He scored in a variety of ways and actually looks pretty polished as a player. Usually if a player is asked to play a bunch of positions like that, they have a tendency to be a jack of all trades and master of none. But for Calloway, he has a really solid football IQ that translates to every position he plays. He can run pretty good routes as a receiver and has very good hands both on offense and defense. He’s quick, and he knows how to evade defenders. 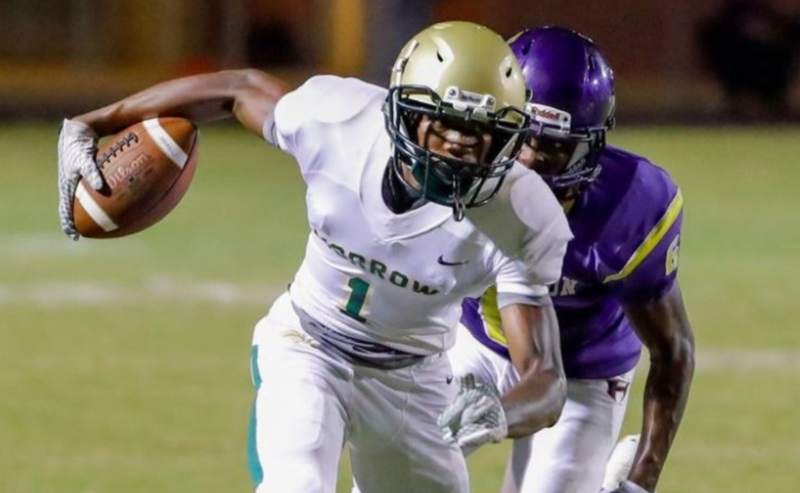 Though his season stats are hard to come by, Calloway already had double digit touchdowns for Morrow through six games this past season. He was also named to the first team offense on the All-Region 4-AAAAAA Team. He was named the Offensive Player of the Year for his region as a sophomore in 2017. With Calloway’s commitment, the Vols now have six recruits pledged to them in their 2020 class. Calloway joins four-star quarterback Harrison Bailey, four-star defensive tackle Dominic Bailey, four-star JUCO defensive end Jordan Davis, three-star running back Ebony Jackson, and No. 1 long snapper Will Albright.